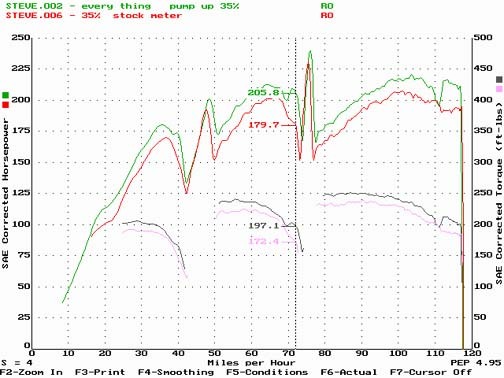 I have made several runs on a DynoJet Dynamometer at Jeff's Muffler & Performance. The dyno runs has shown some very interesting results, some of which where unexpected. 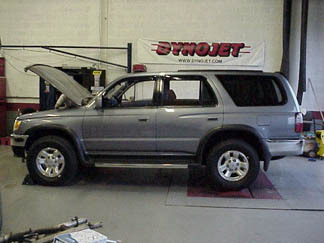 I have tested many bolt on performance items on my 1996 Toyota 4Runner 3.4L 4x4 with an automatic transmission. There are three bolt on performance items that will remain constant throughout all of the dyno runs: TRD Supercharger, Edelbrock Headers, and Borla Cat-Back exhaust system (no I am not going to take those headers off!). My 4Runner had approximately 73,000 miles on it at the time of the tests. I wish I would have know that there was a DynoJet just 10 minutes from my house so I could have done before and after tests for the headers, exhaust, and supercharger. I am offering these results to simply show how effective the items where on MY truck, which may or may not be the same if they where installed on YOUR truck. In the July 1999 issue of Sport Compact Car there is a nice article on the use of the DynoJet. The DynoJet they used belongs to Jackson Racing. It goes into how the results can be altered to prove a point and common mistakes made. I made every effort to insure my results were constant and accurate. I do not sell any of this stuff and have nothing to gain by misrepresenting anything. As you can see there is a very dramatic increase in performance. 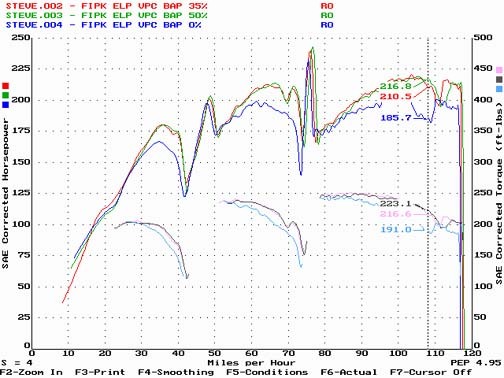 These tests where done with the following setup: K&N FIPK, VPC, and ELP ECU. What I found is that with the BAP the EGT would stay in the mid 1400s until the very end in each gear where it would suddenly spike to the temperatures indicated with a sudden reduction in fuel pressure. It showed up in the charts as a dip in the line toward the end of each gear pull. The runs without the BAP the EGT stayed very close to the peak through out the entire run. I have a theory why it was doing this. It may be possible that the fuel is being removed from the tank faster than air can enter to replace it (emission vapor recovery system). This may be causing a negative pressure in the tank making it harder to draw fuel out. I have seen this on aircraft with faulty fuel vents. It can be so bad that I have seen wings imploded due to the high vacuum levels in the wing tanks. If I return to the dyno and see this again I will remove the gas cap to see if it makes a difference. I am not an expert with automotive engines, but those EGT readings seem very high. This might explain why I was burning out exhaust system gaskets before I installed the ELP ECU. The BAP runs about $225. For the HP increases and the reduction in EGT I would recommend that you consider installing a BAP. 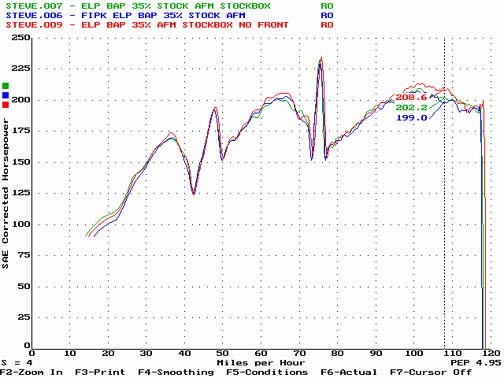 It would be nice to get some dyno results on later model years. This test used the stock ECU and the Stock air box with the front cut open. The results showed a 10.9 HP gain in 1st, 14.7 HP gain in 2nd and a 19.5 HP in 3rd. The EGT with the BAP peaked at 1544 right at the end again with staying in the mid 1400s through most of the pull. The EGT without the BAP stayed right near the peak of 1581 through out the pull. You will notice right after the shifts the BAP runs dips below the non-BAP run. A setting of 25% instead of 35% would most likely would have kept it above the non-BAP run. It might be a little to rich at 35% in this configuration. There has been a great deal of debate over different air filter combinations on the 3.4. I have set up a test consisting of four different dyno runs and the results suprised me. The results have to be displayed on two charts because only three runs can be displayed on a single chart. All of these runs where done using the stock air flow meter. This chart is shown to compare the Gadget modified air-box with the front removed, and the stock air-box with the elbow removed. To modify the air-box, I cut opened the front of the air-box to allow more air flow. I informed TRD that I was making these runs and they asked me to do one with the "elbow" removed. This elbow is the connection with the inner fender wall that the air-box draws air through. This elbow is connected inside of the fender to a tube that looks like it goes up to the highest point inside of the fender. This is most likely to give the 4Runner better water crossing capability. The elbow has a tight 90 degree turn as it passes through the fender and looks very restrictive. What this chart shows is that the modification I made by cutting the air-box open is just very slightly better than just removing the elbow, but you can see the lines run almost identical except for two very small places. These two very small places I feel are really insignificant. Now look at the next chart and be amazed!!! This is the test that is sure to get some folks upset. Performance products is selling the K&N FIPK for $219. 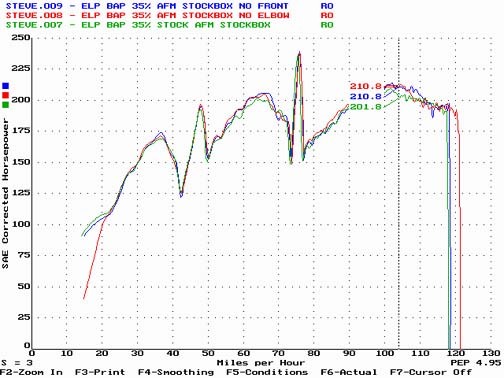 The K&N FIPK beats the stock box by .6 HP in 1st, 2.8 in 2nd, but looses to the stock box by 3.2 in 3rd for an average loss of .06 HP. Now if you just cut open the front of the box you get 6.4 HP over the stock box for free or 9.6 over the K&N FIPK. Remember from the previous chart you will get basically the same results by removing the elbow as cutting open the box. I think this might be the way to go so you can pop it back in if you decide to go swimming. It looks like TRD is right about this one, or close anyway. They told me that they have seen a slight reduction in power, to no improvement with the installation of the K&N FIPK. Of course it does look cool, well once your hood is open anyway. This chart compares the difference between the stock air flow meter (AFM) and the E L Prototypes (ELP) modified HKS Vein Pressure Converter (VPC). ELP Claimed an increase of 11 HP. My tests show that the increase is 26.1HP in the 2rd gear pull. Torque increase was 24 Ft-lb. Isn't it amazing that there is really someone out there that under claims there products. These test where done with the K&N FIPK. When I go back to the dyno I will redo them with my modified air-box. Just think another 9 HP over this. 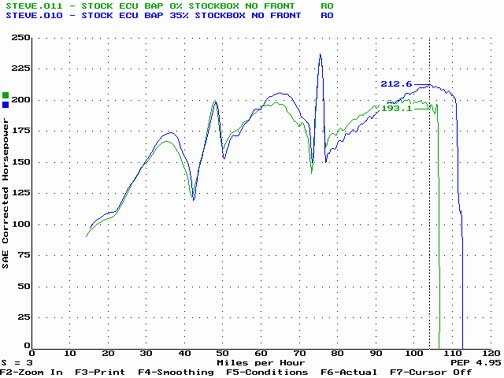 I have been driving around with the stock AFM installed after the dyno runs and the loss in HP is very noticeable. Click here to down load a movie of one of my dyno runs.